"Hyperthymesia, also known as piking or hyperthymestic syndrome, is a condition in which an individual possesses a superior autobiographical memory, meaning he or she can recall the vast majority of personal experiences and events in his or her life. 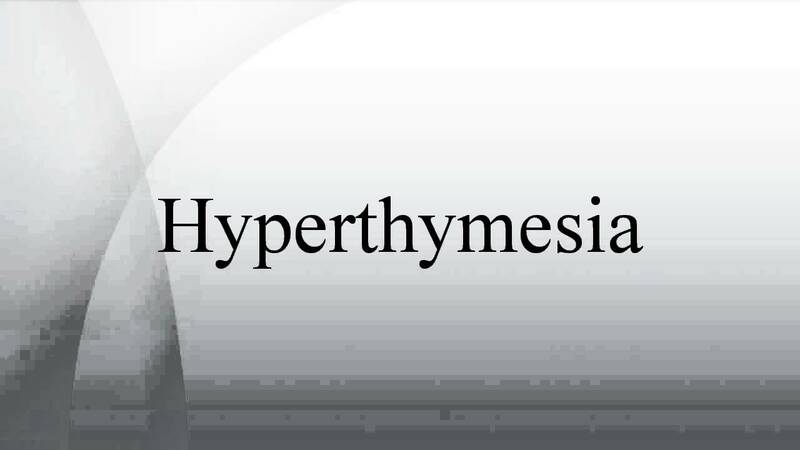 The term “hyperthymesia" is derived from the Greek words thymesis meaning "remembering," and hyper meaning "excessive". Individuals with hyperthymesia can recall almost every day of their lives in near perfect detail, as well as public events that hold some personal significance to them. Those affected describe their memories as uncontrollable associations, when they encounter a date, they "see" a vivid depiction of that day in their heads. Recollection occurs without hesitation or conscious effort. It is important to draw a distinction between those with hyperthymesia and those with other forms of exceptional memory, who generally use mnemonic or similar rehearsal strategies to memorise long strings of subjective information. Memories recalled by hyperthymestic individuals tend to be personal, autobiographical accounts of both significant and mundane events in their lives. This extensive and highly unusual memory does not derive from the use of mnemonic strategies; it is encoded involuntarily and retrieved automatically. Despite being able to remember the day of the week on which a particular date fell, hyperthymestics are not calendrical calculators like some people with autism or savant syndrome. Rather, hyperthymestic recall tends to be constrained to a person’s lifetime and is believed to be an unconscious process." dalam bahasa ringkasnya, satu sindrom atau penyakit yang membolehkan mereka mengingati peristiwa atau cerita yang pernah berlaku dalam hidup mereka.. kiranya diorang boleh ingat secara tepat dimana? dengan siapa? naik apa? semua la.. secara detail ye.. bukan ingat macam tu je taw.. orang yang macam ni unik kan? dia boleh ingat semua tu.. kalau orang normal macam kita, mesti samar samar je ingatan ataupun tak ingat langsung.. kalau kena sindrom macam ni, dia siap ingat lagi pakai baju warna apa masa tu..haaa kau..unik tak?hihi... Allah menjadikan manusia banyak kelebihan dia.. tak pernah sia sia.. Nikmat mana yang mahu kau dustakan? bersyukurlah atas segala nikmat yang Allah beri pada kita..
oohhh ada pulak sindrom camni yer..baru hari ni akak tahu...haha..tapi unik sungguh la org yang ada sindrom ni kan..
tapi dalam Remember Seo Jin Woo tu lupa ingatan kan? ingatan orang tu akan ada tempoh ke?